is already cold, and the leaves haven’t even dropped off the aspen yet. The Steward family certainly sympathizes with your predicament, Bill. We own a house built in 1984 that is lacking in insulation. Mr. Steward used to play the role of “heat Nazi” quite often, demanding that we not turn on the heat until November. Fortunately, since Baby Steward was born, Mr. Steward has lightened up a little, and we’ve had the heat on a few mornings already this year. Although we’ve all read the simple energy-saving tips from replacing weather stripping around doors to installing CFLs, it’s not always that simple. The average Colorado home’s electricity and gas bills are almost $150 per month. If that sounds similar to your utility bills, remember an average home is a long way from being energy efficient. If your goal is to be energy efficient and comfortable (without wearing your down jacket in your house), then you may need to make some substantial changes. But how do you figure out what those changes are? For starters, check out the Energy Star Home Energy Yardstick on energystar.gov to rank your house against other homes in the area. Simply input your annual energy usage or annual amount spent on natural gas and electricity. If you have that information handy, the survey takes less than five minutes. The Yardstick program also generates a list of recommendations to improve the energy efficiency of your home. Like most things in life, you get what you pay for and while free tools like Energy Star and Xcel Energy’s website are a great starting point, they may not give you the information you need. To really get a handle on how to make your home more energy efficient, it’s essential to get a home energy audit. As we head into winter, now is a perfect time to consider an audit, and Xcel is currently offering fantastic rebates to homeowners to make audits affordable. A 2,500-square-foot home energy audit typically costs around $350, but with the Xcel rebates, homeowners pay only $150. Air leakage is the No. 1 energy problem in most homes. In fact, many homes have air leaks that are the equivalent of leaving a window open all year. Without an energy audit, it’s nearly impossible to find hidden air leaks. Professional energy auditors have specialized training and tools to measure air leakage and other efficiency issues. With an infrared camera, the auditor can quickly show the homeowner images that demonstrate where heat loss is occurring. With a blower door test, the auditor can discover the source of air leakages in a matter of minutes. A blower door is a contraption that installs into an exterior doorframe and blows air out of the home with a high-powered fan. Through depressurizing the house, the auditor and homeowner can easily locate where air is entering the house. Most importantly, the auditor provides a detailed report and key recommendations based on his/her findings. In addition, an audit can help identify issues that may be adversely affecting indoor air quality, like mold or mildew. Health and safety issues may also be discovered, including high carbon monoxide levels or structural concerns. 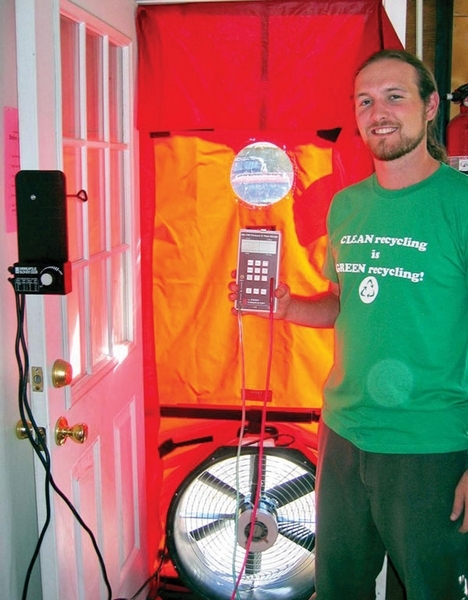 An energy auditor looks at the entire home as a system. For instance, placing insulation in the floor above a crawl space may help with energy efficiency, but can sometimes create conditions for wood rot and mold growth. This “whole house” approach allows the auditor to provide recommended solutions that will decrease utility bills, and make your home more comfortable, healthy and durable. You will need to use an Xcel-qualified home energy auditor to get the new Xcel rebate. We (at the High Country Conservation Center) have an Xcel-qualified home energy auditor, and there are also several other local qualified auditors. As a community nonprofit, we are here for you. We can tell you where, exactly, that can of spray foam will do the most good, or we can provide information about other local energy service providers. Visit us at http://www.highcountryconservation.org or call us at (970) 668-5703.